Our firm is reckoned as an eminent trader and supplier of finest quality Natural Hand Split Granite Pavingstones. For the convenience of clients, our highly reliable vendors process this granite cobblestone as per their specifications in terms of size, design and dimensions. High strength, dimensional accuracy, perfect finish, glossy look and crack & stain resistance are some of the significant features of this cobblestone. This Natural Hand Split Granite Pavingstones is used in making landscaping and pavements of residential and commercial complexes. We are offering a wide range of cobbles at affordable prices as we being the direct manufacturer, exporter and supplier of various granite products. Customised sizes, thicknesses and finishes available on request. 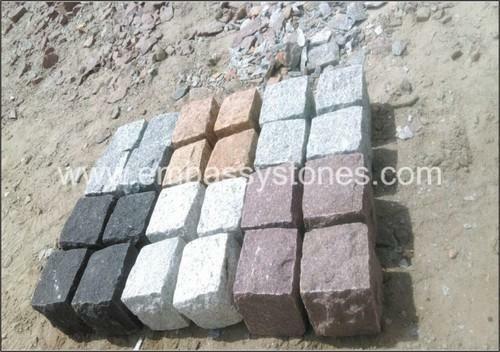 Come up with a passion towards excellence and innovations, we, Embassy Stones Pvt Ltd have carved a niche in this challenging and tough market competition within very short period of our establishment in industry. Since two decades since that period novelty, price as well as quality have always been the basic factors for our progress in industry. We commenced business as a private owned organization and are engaged in manufacturing, supplying, trading and exporting a huge assortment of Granite Fountains, Limestone Slabs, Wall Claddings, Veneer Stones, Sphere Stones, Natural Sandstone Slabs, Natural Limestone Paving Stone, Paving Cobblestones and many others. Highly acclaimed for their elegant designs, beautiful patterns, smooth finish, rugged construction, dimensional accuracy and other vital characteristics, our products have got wide acceptance by the customers spread all over the globe. The quality of whole products is duly examined on several stringent parameters, to make sure clients that the final range is in strict compliance to the norms suggested by industry. Also, our company has adopted latest methods and techniques of production to, which have made the products innovative and as per clients’ expectations.